The Pomodoro technique is a time management technique that improves productivity by helping you focus on your work and getting rid of the distractions. It involves using a timer to break down work into 25 minutes intervals, separated by short breaks. These time intervals are labeled as “work sessions” or pomodoros, and the time between them as “break time”. Most practitioners spend 25 minutes working and 5 minutes on a break. The work sessions and breaks rotate regularly, and after some time, you take a longer break. Francesco Cirillo was the first to coin this time management technique in the 1990s. He found the inspiration for the name in the pomodoro-shaped kitchen timer he used to measure his own progress. There is a number of timer apps that work on the principle of the Pomodoro technique. The most simple Pomodoro timers are Tomighty (free desktop app for Mac and Windows), Tomatotimers (web and Android), and Be Focused (for iPhone). You can also use a Chrome extension like Strict Workflow, which tracks time Pomodoro style plus prohibits you from procrastinating. On YouTube, you can find videos where people work and track time using this technique, so you can track time along with them. If you’re already tracking time for business purposes, the Pomodoro mode in Clockify time tracker app for Mac will be perfect for you. 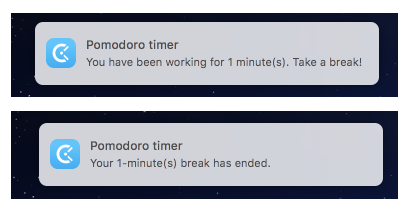 While you track time for tasks, you’ll get a desktop notification once you reach the end of the Pomodoro interval so you can stop the timer for the current task and take a break. And, because our concentration levels drops, we either give up, or rush the project, which brings down the quality of our work. So, what can we do about this? The answer is not in how much time we actually need to finish something, but in how we parse the time we have at our disposal. And this is where the Pomodoro technique will help you. The benefits of the Pomodoro technique also have foundation in scientific studies. A study from the University of Illinois states that “brief diversions” are good for our concentration. So, when you’re working on a large task for a long period of time, it’s best that you take short breaks – this helps you retain focus once you resume working on said task. So, the 5 minute breaks prescribed by the Pomodoro technique actually help the quality of your work. Another research in favour of the Pomodoro technique at Florida State University indicates that the human body works in cycles of about 90 minutes – everyone has a certain cycle determined in minutes, when they are the most productive. But, once 1 cycle is over, in order to maintain your productivity levels, you should take a break and recharge. If you don’t, you’re in danger of suffering from the Ultradian Stress syndrome – which means, when you disrupt your ultradian rhythms, you lose mental focus, make more mistakes, and lower your overall job performance. When you determine the time you should spend focused on a task, you are actually more likely to focus on said task. You’ll be able to differentiate between the time you should spend working and the time you should be on a break, and act accordingly. So, when you start a working session, you’ll know this is the time you should focus solely on your work. You shouldn’t let anyone distract you, or procrastinate. But, when you hear the timer alarm sound, you’ll know you can rest for a short while. After some time practicing Pomodoro, you’ll realize, that you have made it your habit to focus during work sessions and unwind during breaks. As a contrast, working continuously without a schedule only makes sure you spend a lot of time procrastinating and unfocused, because there isn’t a break to motivate you to push forward. The Pomodoro technique is also likely to help you focus as you get accustomed to associating the timer you use for the Pomodoro technique with work time. You’ll learn to switch to work mode every time you open your timer. Tracking your time at regular intervals will help you create better estimates. For example, you parse your daily workload into 25 minute Pomodoros, and start working. This workload may be a small project you have to finish within a day, so you parse the project into tasks, and then assign each task to one Pomodoro. After a while, you may notice that it takes you more than 25 minutes to finish one type of tasks, and less than 25 minutes to finish another type of tasks. This revelation will help you parse your tasks better in the future, by maybe assigning two Pomodoros for the first type of tasks and grouping a few smaller tasks into one Pomodoro. At the end of the day, you’ll know the number of Pomodoros you can finish during your work hours, and you’ll be able to create better time estimates for your clients. For example, you finish 8 tasks within 16 Pomodoros and notice you’ll need to work for 16 more Pomodoros to finish the project. But, you see that the estimated budget for the time you’re going to spend on the project won’t be enough to cover expenses and ensure you make enough profit. As you’ll know it will take 16 more Pomodoros, or about 7 hours, to finish a project, you’ll know to contact the client to revise the budget, and increase your hourly rate in the future for that type of projects. Clockify gives you the option to easily set rates, calculate, and track billable hours in real time. You can even export your billable hours for invoicing with the click of a button. When you have a lot of work to do within a day, it can be tempting to just work continuously until you’re finished. But, this is a counterproductive practice that causes a decrease in the quality of your work as time goes by. You continue working with no clear schedule and no breaks, and simply burnout until the end of the day. About 50 percent of people from the United States have experienced burnout? Burnout is a physical or mental collapse, usually caused by massive stress and overwork. It can arouse symptoms such as anger, irritableness, chest pain, shortness of breath, dizziness, and more. To find out more, read our comprehensive post about how too much work can lead to burnout and affect your health. But, if you parse your time with Pomodoros, you’ll ensure you know how long it may take you to finish, because you’ll know how many Pomodoros you can do in a day. You’ll also know when you’ll be allowed to take breaks, so you’ll have smaller goals to reach, which will help you stay focused. Also, when work sessions and break time rotate regularly, you’ll no longer have the sense your workday will never end – you’ll have an estimate about how many Pomodoros you have left to do, which will help you feel more at ease. The Pomodoro technique gives you a simple way to tell how productive you were, because you can always count the number of Pomodoros you have finished within a day. Say you’re interested to see what day of the week was most productive for you. You can just count the number of Pomodoros you finished each day, and see when you had the highest score. You may find the Pomodoro breaks to be “unnatural”. After all, you take them when the timer goes off, and that may not necessarily be when you’re feeling tired. But, these “unnatural” breaks actually help you resume your work faster. When you take a break at fixed intervals, chances are you have left something half-finished, so you’ll have no problem with continuing afterwards. The break may even serve you as the time to think about the matters you can tweak and be more creative with when you resume work. In contrast, when you take a “natural” break, i.e. when the task is most difficult, once you resume your work, chances are you still won’t have a solution to your problem, which will make you feel demoralized and unmotivated. Some may find the rules of this time management technique to bee too rigid. This includes the fixed time intervals intended for you work sessions and breaks. The rules state you should stop working on your task as soon as you hear the sound alarm, which can be counterproductive if you’re doing well with your work. But, you may want to disregard Pomodoro when you’re making progress. If you feel you’re doing especially well with a part of a project, you shouldn’t feel obligated to stop after 25 minutes; you can simply go on until you feel the time is right for a break. Some people may thrive with the prescribed “25 minute work sessions” and “5 minute breaks”, but others may find that other time intervals work better for them. So, you may want to tweak the rules to fit your needs. For example, if you’re a programmer, you’ll probably have a number of smaller tasks, tasks that take you about 10 minutes. So, you’ll probably work best if you work in 10 minute Pomodoros. Or, maybe you find that 25 minutes isn’t enough for you to engross yourself in work. You can set the timer to 45 minute Pomodoros, with longer breaks, say, 15 minutes, with a 30 minute big break. 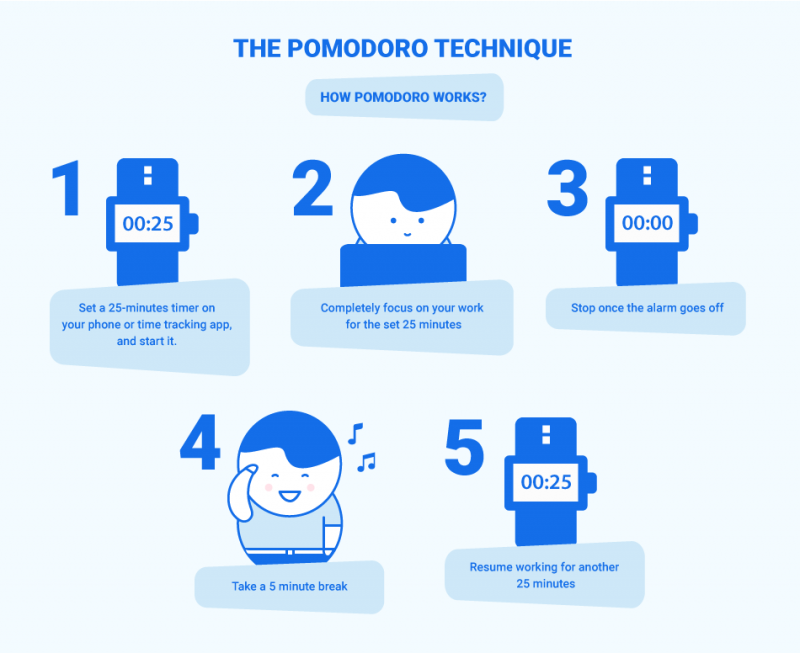 With longer Pomodoros and breaks, you’ll have enough time to work and enough time to unwind. And maybe you feel stressed over the thought that a timer is counting down the precious seconds of your break time? You may want to choose to set off the timer when on a break, and make break time more flexible. List each 25-minute work session on a piece of paper, and then put a check mark next to each item once you are done with it. This way, you’ll always have a sense of progress, so you’ll feel motivated to continue until you’ve reached the end of your list. Once you start the timer, it’s vital that you concentrate on what you’re doing. This means you should refrain from checking your Facebook feed, reading new posts on your favorite Reddit topic, or staring aimlessly through the window during this period. The Inform/Negotiate/Call back technique will ensure you stay dedicated to your 25-minute routine, without offending the person who wanted to engage in conversation. Use your 5-minute breaks well. Don’t just sit in your work area until the 5 minutes are up. You can take a bathroom break, refill your glass of water, or make a cup of tea or coffee. In addition, you can stretch yourself, go for a short walk, or engage in another similar activity. The important detail is that you change your environment, and notify your body you’re on a break; this will help keep your productivity and motivation at optimal levels once you start the timer again. As long as you follow the “work time” – “break time” – “no disruptions” formula, you can tweak your time tracking with the Pomodoro technique the way it works best for you.